The power of the network can leverage even a small number of personal artifacts and materials on a very specific subject into a visceral and meaningful engagement with history. 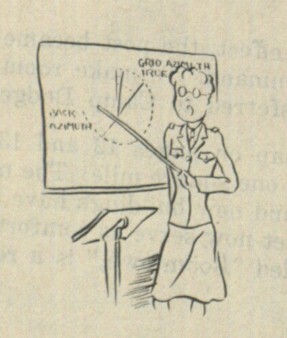 One such item is the Handbook for the Woman’s Army Auxiliary Corps. Fort Des Moines Iowa, dated 1943. 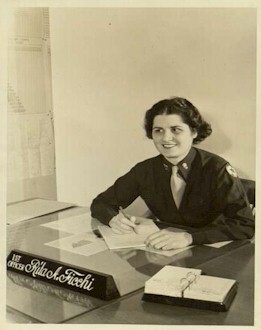 Enclosed in the Handbook is a photograph of the Fort’s First Officer Captain Rita A. Ficci. It was donated to Falvey’s Special Collection by an Augustinian, Father Thomas Roland, in 1962. 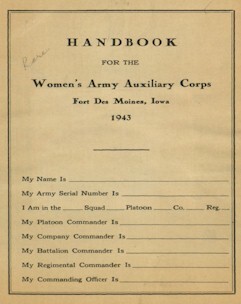 The Woman’s Army Auxiliary Corp was a division of the U.S. Army for citizens of the female gender, created in 1942 and moved to active status in 1943 during World War II. Women served their country actively in this conflict. Reading this Handbook, which was designed to be given to each new arrival at the Fort, brings to mind another time, and gives guidance on the transition from civilian to military life. Specific instructions are given on uniforms, military bearing, what to wear, hair care, saluting, and the military police. Even a map of the post is included. Organizations such as the Women Veterans Historical Collection at the Betty H. Carter Women Veterans Historical Project at the University of North Carolina at Greensboro, collect and display large collections of these resources. While the Fort Des Moines Museum also strives to document the past, in this case the mission is to preserve information about a place; the museum’s online photo gallery of Army Women at Fort Des Moines, Iowa 1942-1945 shows the training and service of women like Captain Ficchi. But in an online environment resources at any one institution, even an institution with a small collection of unique items, can add to the total body of information available about a subject. In the case of primary materials like Captain Ficchi’s photograph and this handbook, small pieces of a puzzle can be added together to create a more complete whole. This is my mother’s work. She died on Dec 2, 2004. I have done her oral history, and she contributed some of her WAC memorabilia to the Women in Military Service to America Memorial in Arlington VA.